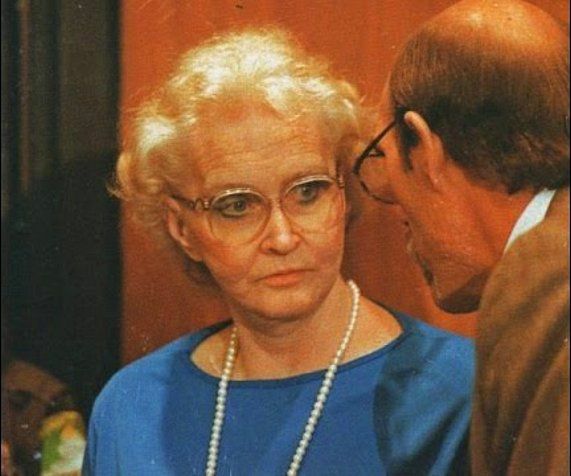 Dorothea Puente was born in San Bernardino County, California on 9 January 1929 as Dorothea Helen Gray and raised in an orphanage because both parents were alcohlics who died when she was young. In 1945 she married Fred McFaul and gave birth to two daughters but gave them both up. After just three years of marriage her husband left. An attempt at chequebook fraud resulted in a year in jail. When she was released Puente fell pregnant and gave up the resulting daughter for adoption. In 1952 she married Axel Johanson. Eight years later she was jailed for 90 days for running a brothel and then began working as a carer, looking after disabled and old people in private homes. In 1966 in Mexico City she married Roberto Puente who was 19 years younger than her, but the marriage ended after two years. She then took charge of a three-storey, 16-bedroom care home at 2100 F Street in Sacramento, California. In 1976 she married an alcoholic named Pedro Montalvo but they soon split. Puente took to hanging around in pubs looking for old men, whose signatures she then forged to steal their pensions. Despite being arrested and charged, she continued to commit fraud while on bail. In 1981 she moved into an upstairs flat at 1426 F Street in downtown Sacramento. In April 1982 61-year-old Ruth Monroe began living with Puente but died not long after, although police adjudged her death a suicide. On 18 August 1982 Puente was jailed for five years for theft. Released after three, she moved back into 1426 F Street with Everson Gillmouth, her 77-year-old pen pal from prison. In November 1985 Puente asked Ismael Florez to help with some DIY and gave him a car in return. She then asked him to build her a box 1.8 m by 90 cm by 60 cm (6 ft by 3 ft by 2 ft) to store “books and other………………………………………………………………..
Puente’s trial began in February 1993 and lasted five months. One hundred and fifty-three witnesses took the stand and 3,100 pieces of evidence were presented. The jury found Puente guilty of murdering Dorothy Miller, Benjamin Fink and Leona Carpenter but could not reach a verdict on six other charges so Superior Court Judge Michael Virga declared a mistrial. On 10 December 1993 he sentenced Puente to prison for life without the possibility of parole. In 2004 she wrote a recipe book, Cooking With A Serial Killer.